Much of the negativity that radiated through markets has mostly faded - for now. Investors can thank optimism over trade talks between China and the United States and the Federal Reserve's dovish address for the mood change. 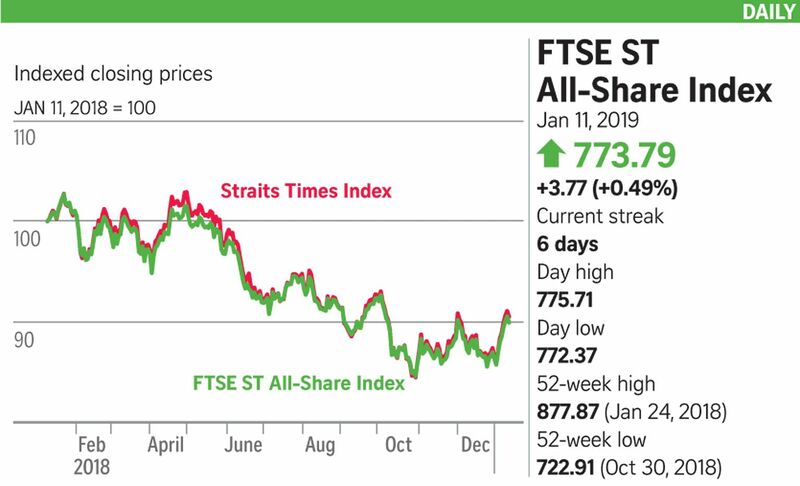 Mr Toby Wu, senior analyst at eToro, said: "With 1.1 per cent of Singapore's GDP indirectly contributed by bilateral trade between the US and China, financial and industrial sectors have shown to be the top performers this week due to the US-China trade optimism." But he also noted that "the monster rally we've been seeing in Singapore" lost some steam yesterday. Another headline development was Oxley Holdings' proposed sale of its Stevens Road hotels for just under $1 billion. The buyer is said to be Indonesian magnate Tahir. The stock rose 6.8 per cent to 31.5 cents.